I picked up a 2010 Topps 'Honus Wagner' cereal box [$9.99 each at Target], a 2010 Topps jumbo pack [$4.99 each at Target] and a 2010 Upper Deck Fat Pack [$4.99 each at Target] - I thought I'd impusively pick up one of the Topps cereal boxes, since it is a half the price of a blaster and I've never busted one of these before. I will concede, I was also looking for a Topps Million Card Giveaway redemption code card - even though the contest seems like an exercise in futility for a baseball card collector looking for what I may consider a historically valuable Topps card. Much to my wallet's detriment however, the Topps' Million Card Giveaway promotion will probably make me - pick up one more pack, one more jumbo pack or perhaps cereal box of 2010 Topps baseball cards that I may have otherwise ignored [since the cards are plentiful and found everywhere]. Out of the cereal box - I pulled the following in addition to the typical base cards / inserts. 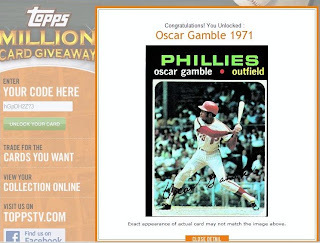 From the jumbo pack - I pulled a Topps Million Card Giveaway redemption code card. 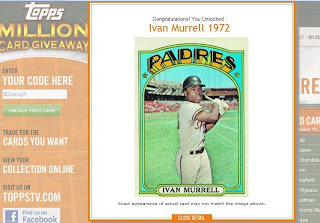 #TMC-4 Ichiro - Million Card Giveaway redemption / redeemed online for a 1972 Topps Ivan Murrell. I finally was able to redeem my lone Topps Million Card Giveaway redemption card and landed this beaut - I think the redeemed redemption card is worth more [TMC-3, picturing a 1963 Topps Bob Gibson], than the 'original' Topps card of Forsch. I think it is going to be a tough decision, whether or not I'll actually want the card in hand - hah! 2010 Upper Deck retail [$1.50 each / $4 for three packs from a booth at a card show] - you can't see his face, the front of his uniform or the logo on the cap he is wearing, but Aaron Rowand's card [#427] is a pretty damn good looking card. The ball looks like it is going to sail into one of the gloves reaching for it from the stands, but it shows Rowand at his finest - going all out, regardless of the result. 444 Franklin Gutierrez - he isn't an all-star yet, but the player referred to as 'Death to Flying Things' has quietly developed into one of the top outfielders in the American League. CP-15/CP-16 Kristen Stewart / Robert Pattinson - Celebrity Predictor insert / I don't know what to make of this card or the insert set. It isn't like middle age baseball card collectors are buying flagship Upper Deck for 'pop culture' insert cards, nor are tweens/teenyboppers looking to bust baseball card packs to find cards like the Celebrity Predictor inserts. 544 Ballparks - the one in Boston, Massachusetts where the Big Papi lurks. 2010 Upper Deck retail [$1.50 each / $4 for three packs from a booth at a card show] - I think Upper Deck messed up on Carlos Pena's card [#481], because it seems like Carl Crawford pictured and not the slugger who hit 39 home runs and shared the American League home run title in 2010 with Mark Teixeira. 228 Darin Erstad - his status as an active player seems to be in jeopardy. He represents one of the last links to the Angels I grew up watching through the mid 1990s, hounding at the ballpark, et al. 2010 Upper Deck retail [$1.50 each / $4 for three packs from a booth at a card show] - I wasn't looking for any particular hits [like I've read and heard, flagship products are all about 'set building' and this product is UD's flagship baseball brand, not Ultimate Collection]. I was hoping to get a smattering of base cards - particularly some of the 40 Star Rookies featured, even though they are part of the set and I assume are not anymore special, other than they feature rookies who made their debut in 2009 and feature UD's own version of the Rookie Card logo. The fact these cards are not licensed by Major League Baseball is something to think about - but I'm not a baseball card traditionalist/snob and was more intrigued, than put off by the idea these cards are only licensed by MLBPA. Like previous UD flagship releases, the images on the cards are generally sharp - the images are not as distorted as other collectors would like to assume. Perhaps choosing suitable images [i.e. team names/logos on jerseys either obscured or not visible at all] to use on cards made the people at Upper Deck take a closer look - rather than just plopping any old photo on a card. 5 Brian Matusz Star Rookie - pronounced 'Mattis,' probably the best lefty pitching prospect in all of baseball. 555 Ballparks - not identified by name, it is the one in Los Angeles, where Kirk Gibson hit his iconic home run in the 1988 World Series. 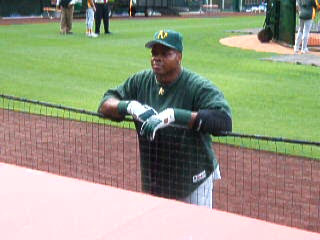 Frank Thomas announced his retirement on Friday - I remember him going neck-and-neck with Ken Griffey Jr. as the two players considered the biggest hobby stars through much of the 1990s. A possible blemishes holding 'The Big Hurt' back from first-ballot Hall of Fame status is the designated hitter issue, which should be a somewhat relevant issue for evaluating Thomas as a player - but shouldn't otherwise overshadow his accomplishments [including being two-time MVP in 1993 and 1994, hitting 521 home runs, having .301 lifetime batting average while generating a .419 on-base percentage ]. In his career, 'The Big Hurt' was always selfish about his stats and outspoken about his contract and his perceived value in the early 2000s - he kind of soured on people as his all-world hitting skills somewhat declined. 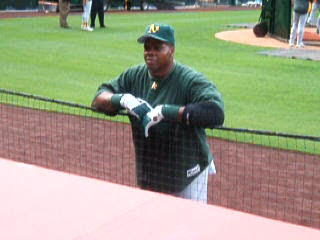 However, when he was hitting the ball in his peak during the 1990s - the man was considered to be what Albert Pujols is today and every baseball fan / baseball card collector wanted a piece of him. His best mainstream rookie card was probably from the 1990 Leaf set [card #300] - as Thomas' popularity waned over the last part of his career and the Leaf's value decreased [maybe around $10 these days, a little more if professionally graded], his 1990 Topps 'no-name on front' was still a well sought-after card by dedicated Thomas collectors. #CMT 56 Dustin Pedroia - The Cards Your Mom Threw Out insert; 2007 Topps. #WTWY RM Russell Martin - When They Were Young insert; damaged. #CMT 46 Pedro Martinez - The Cards Your Mom Threw Out insert; 1997 Topps. # CMT 9 Carl Yastrzemski - The Cards Your Mom Threw Out insert; 1960 Topps. 2010 Topps Series 1 blaster box [eight packs plus two Throwback packs with an old-school Topps logo and non-color grey stock backs] - I like the fact there is at least one insert in each pack, though it is merely a small consolation prize, like something out of a Cracker Jack box. #CMT 53 Alfonso Soriano - The Cards Your Mom Threw Out insert; 2004 Topps. #TMC-3 Million Card Giveaway - I assume this is a redemption card and not just an information card, though I could be wrong. Here is how I see this promotion - I redeem the card online to find a 1986 Topps Brett Saberhagen, 1988 Topps Mark Gubicza or a 1991 Topps Jerry Don Gleaton. It is not actually going to be in-hand, though for a fee, the actual card will be shipped to me. #CMT 32 Ryne Sandberg - The Cards Your Mom Threw Out insert; 1983 Topps. 2010 Topps Series 1 blaster box [$19.99 each] - I needed to satisfy my 2010 baseball card fix and eagerly wanted to get to a local Target once I got back to the U.S., after I'd spent three weeks abroad in the island nation of Philippines for a sort of a homecoming / vacation. MCP 21 Orlando Cepeda - 1967 World Series Commemorative patch; two dinged corners, a pin-sized tear on the right hand side of the card. The card looks cheap because the area where the manufactured patch glued on is just grey stock cardboard. A manufactured patch glued onto faux cloth material would look better than one left the way it is on these patch cards - the manufactured patch already looks shabby and now the rest of this year's cards looks homemade and produced to get a lot of the cards out into circulation.